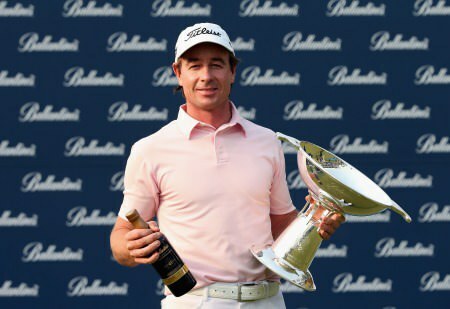 The 35-year old wobbled late in regulation to fall into a tie with fellow Australian Marcus Fraser and Scotland’s Peter Whiteford before his wondershot gave him his fourth European Tour win and his first for six years. The Australian raced to the turn in just 30 shots on a tense final day and had led by two strokes with two holes to play before running up a double-bogey six on the 17th hole, following a wayward tee shot which resulted in a penalty drop. 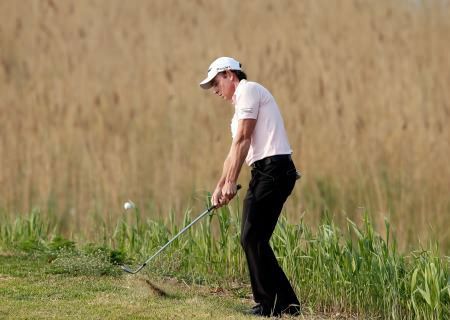 Another miscued drive deep into the woods right of the 18th hole meant he had to hole out from eight feet just to save par, and when Fraser also parred the last, Whiteford knew that ‘only’ a birdie four separated him for his debut European Tour title. The 32 year old chipped to five feet having failed to find the green with his approach, but narrowly missed the subsequent putt to finish tied with Rumford and Fraser. Damien McGrane showed signs of a return to form despite a closing 74 at Blackstone Golf Club. Picture James Cheadle/www.golffile.ieThe trio returned to the 18th tee and, after a phone call to his coach Pete Cowen, Rumford struck a perfect drive down the middle of the fairway. 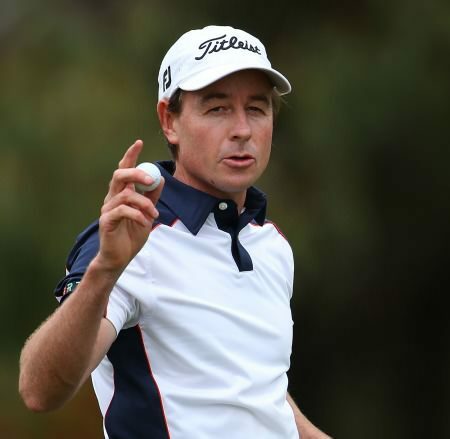 Having subsequently seen both his opponents fail to locate the green with their second shots, the Perth native struck a stunning approach to seal victory. 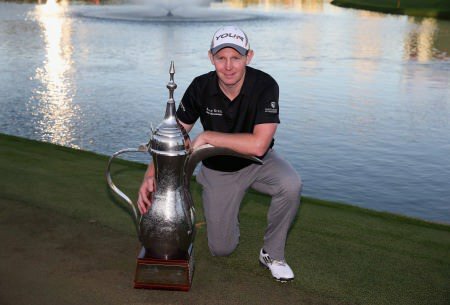 “A lot of thanks goes to Pete [Cowen],” said Rumford, who also paid tribute to caddie John “Ronnie” Roberts as he climbed to 18th in The Race to Dubai thanks to his winner’s cheque for €367,500. “I battled with my driver constantly, and I guess that’s what keeps me out of most golf tournaments. “I left a few drives right – it wasn’t just the last two drives, it was the whole back nine I was feeling stuck and a little bit trapped. So I had a quick word with Pete, hit five or six balls off the first tee [before the play-off] and it obviously did the trick. Frenchman Romain Wattel finished in fourth place on nine under par, with world No 7 Louis Oosthuizen a shot further back in fifth. Overnight leader Alex Noren was penalised a shot at the second hole when his ball moved a fraction as he addressed his putt, the Swede eventually posting a round of 74 to finish in a tie for sixth place. As for the Irish, Peter Lawrie and Paul McGinley finished joint 31st on two under with Damien McGrane a shot further back in 40th. Lawrie played sensationally from tee to green, missing just two fairways and two greens, but had 34 putts in a 71 as he picked up €16,684. European Ryder Cup McGinley played his best golf since he was third in last June’s BMW International in Cologne, racking up six birdies with three of them coming in the last five holes as he posted a closing 68. While McGrane will be disappointed with his 74 he showed signs that his game is not far away as he joins Lawrie, McGinley, Michael Hoey and Gareth Maybin in the Volvo China Open at Binhai Lake Golf Club from Thursday. 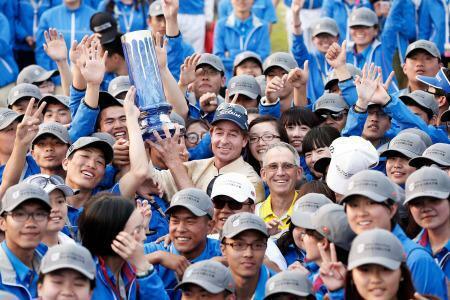 Local hero Brett Rumford is chasing his third win of the season in the ISPS Handa Perth International. Picture © Getty ImagesPeter Lawrie is on track to retain his European Tour card in Australia but a third round 74 leaves David Higgins needing a hot finish in the ISPS Handa Perth International in avoid another trip to Q-School.